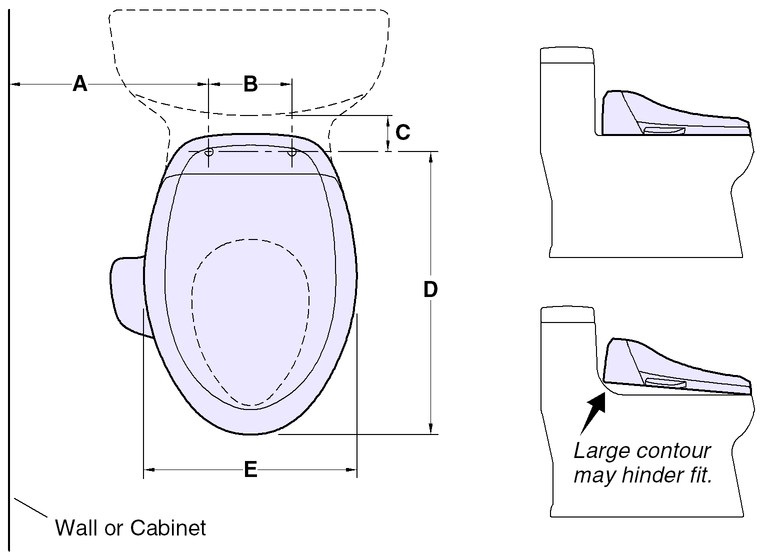 KOHLER bidet toilet seats can be installed to non-KOHLER toilets that have compatible dimensions. Refer to the information in the following sections to see if your toilet can accommodate the KOHLER bidet seat. A 13-1/4" (337 mm) Distance from the mounting hole and a wall, cabinet, or other fixture This is the recommended minimum clearance for maneuverability and proper seat operation. B 5-1/2" (140 mm) Distance between the mounting holes The space between seat mounting holes may vary depending on the toilet style. Verify that the holes on your toilet will accommodate the bidet seat. C 2-1/8" (54 mm) Minimum space between the tank and the center of the mounting holes The contours of some toilet tank styles may not allow proper clearance for bidet seat installation. D 18-11/16" (475 mm) Distance from the mounting holes to the front of the seat This bidet seat is designed for an elongated bowl. If your toilet bowl measurement is shorter than this dimension, the seat will overhang the rim. 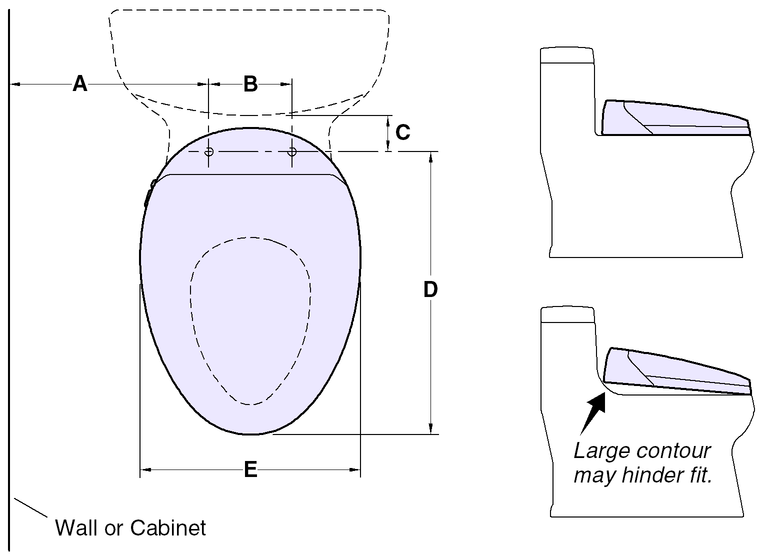 E 14-5/16" (364 mm) Bidet seat width If the width of your toilet bowl is less than this dimension, the seat will overhang the rim. C 1-7/8" (51 mm) Minimum space between the tank and the center of the mounting holes The contours of some toilet tank styles may not allow proper clearance for bidet seat installation. D 18-1/4" (464 mm) to 19-5/8" (498 mm) Distance from the mounting holes to the front of the seat This bidet seat is designed for an elongated bowl. If your toilet bowl measurement is within this range, the seat can be mounted flush with the rim. If your measurement is shorter than this range, the seat will overhang the rim. E 14-1/8" (359 mm) Bidet seat width If the width of your toilet bowl is less than this dimension, the seat will overhang the rim. 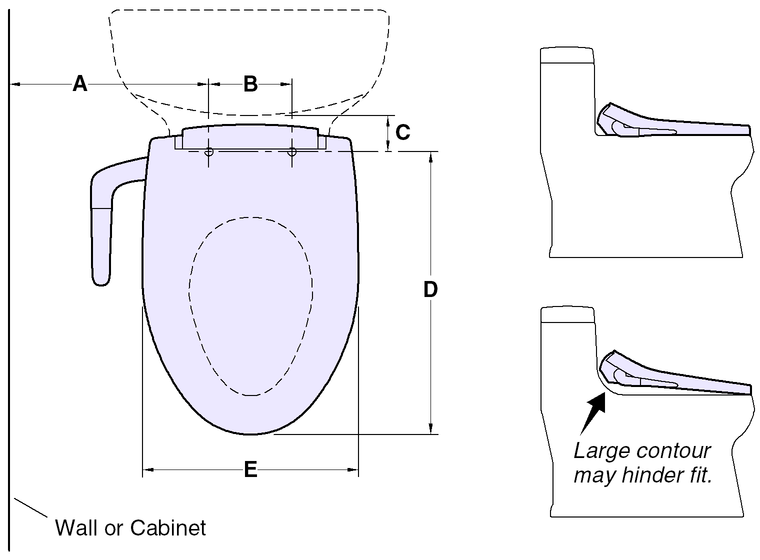 C 2" (51 mm) Minimum space between the tank and the center of the mounting holes The contours of some toilet tank styles may not allow proper clearance for bidet seat installation. D 17-7/8" (454 mm) to 19-3/8" (492 mm) Distance from the mounting holes to the front of the seat This bidet seat is designed for an elongated bowl. If your toilet bowl measurement is within this range, the seat can be mounted flush with the rim. If your measurement is shorter than this range, the seat will overhang the rim. 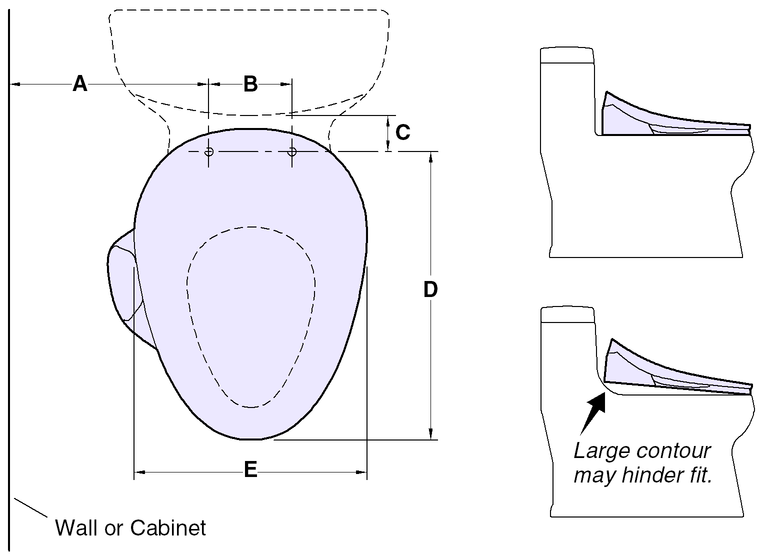 E 14-9/16" (370 mm) Bidet seat width If the width of your toilet bowl is less than this dimension, the seat will overhang the rim. C 1-3/8" (35 mm) Minimum space between the tank and the center of the mounting holes The contours of some toilet tank styles may not allow proper clearance for bidet seat installation. D 18-1/4" (454 mm) to 19-1/4" (489 mm) Distance from the mounting holes to the front of the seat This bidet seat is designed for an elongated bowl. If your toilet bowl measurement is within this range, the seat can be mounted flush with the rim. If your measurement is shorter than this range, the seat will overhang the rim. E 15-3/8" (391 mm) Bidet seat width If the width of your toilet bowl is less than this dimension, the seat will overhang the rim.